Walker & Company, 9780802714992, 320pp. "There is perhaps no better way to prepare for the scientific breakthroughs of tomorrow than to learn the language of geometry." Brian Greene, author of "The Elegant Universe"
The word "geometry" brings to mind an array of mathematical images: circles, triangles, the Pythagorean Theorem. Yet geometry is so much more than shapes and numbers; indeed, it governs much of our lives from architecture and microchips to car design, animated movies, the molecules of food, even our own body chemistry. And as Siobhan Roberts elegantly conveys in "The King of Infinite Space," there can be no better guide to the majesty of geometry than Donald Coxeter, perhaps the greatest geometer of the twentieth century. Many of the greatest names in intellectual history Pythagoras, Plato, Archimedes, Euclid were geometers, and their creativity and achievements illuminate those of Coxeter, revealing geometry to be a living, ever-evolving endeavor, an intellectual adventure that has always been a building block of civilization. Coxeter's special contributions his famed Coxeter groups and Coxeter diagrams have been called by other mathematicians "tools as essential as numbers themselves," but his greatest achievement was to almost single-handedly preserve the tradition of classical geometry when it was under attack in a mathematical era that valued all things austere and rational. 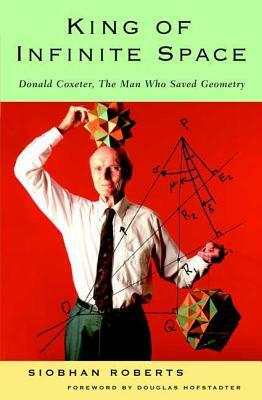 Coxeter also inspired many outside the field of mathematics. Artist M. C. Escher credited Coxeter with triggering his legendary Circle Limit patterns, while futurist/inventor Buckminster Fuller acknowledged that his famed geodesic dome owed much to Coxeter's vision. "The King of Infinite Space "is an elegant portal into the fascinating, arcane world of geometry.